Back at my college, instead of being a big Thursday night party school, my school was a Wednesday party night school. It could have been because no one wanted to wait until Thursday to start drinking heavily (we were ranked as the #20 Party School my freshman year). But more than likely it was because the only classes on Thursday morning were science labs, so most of the school could sleep in until 10:30 or 1:40 depending on their schedule. 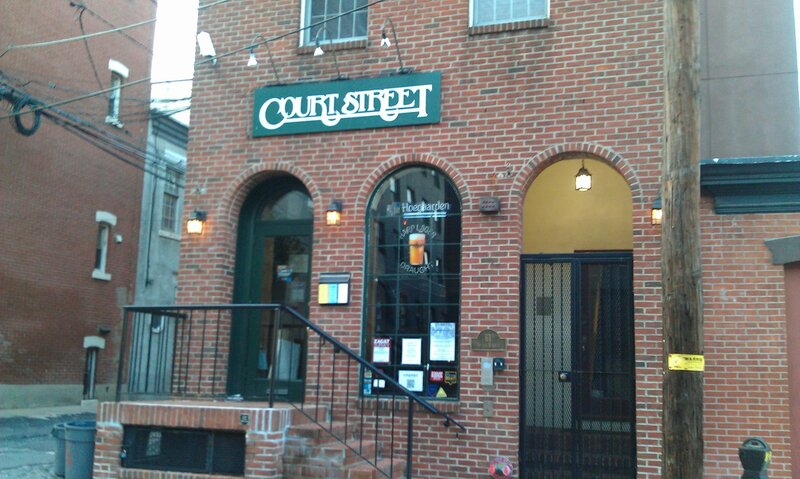 Nowadays, I don’t typically go out on a Wednesday, but this past Wednesday I bucked the trend, took a page from my college lifestyle, and headed over to Court Street Restaurant and Bar for a couple of drinks. I was especially happy and excited to head over to Court Street being that I just finished watching my St. Louis Cardinals knock off the Phillies in an exciting NLDS game. 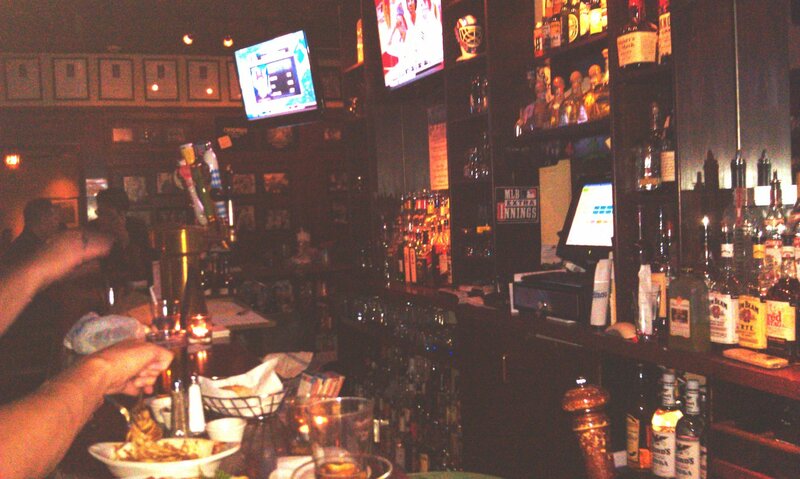 We walked over to the bar, which is located on coincidentally enough the intersection of Court Street and 6th Street. For those of you not familiar with downtown Hoboken you may end up missing Court Street, but it’s the little alleyway between Washington and Hudson Street. Its actually a cute historic little cobblestone street that fits about one car at a time and provides a nice little walkway away from the hustle and bustle of Washington Street. We walked into Court Street and I was actually genuinely surprised at how crowded the place was. Nearly every seat was taken at the bar which probably seats around 15. Plus all of the 2 seat high tops were full. A lot of those customers also had dinner as most of the crowd chose to eat while watching the games rather than dine in the fancier dining room in the back. Luckily two customers got up and left right after we walked in (hopefully a coincidence and not because I walked in) and we had 2 seats at the bars. There were big HD TVs up behind the bar playing the baseball highlights and women’s college volleyball and a fully stocked bar. I ordered the Ayinger Oktoberfest-Marzen that was on tap, and my date had a glass of white wine. The Ayinger was very tasty with a nice toasty flavor to it. Court Street certainly has an extensive wine list and I noticed that they have a version of the wine on tap system. This is probably so that they can keep an extensive list of wines by the glass and still ensure freshness. This is the first time I have noticed a wine tap in Hoboken. 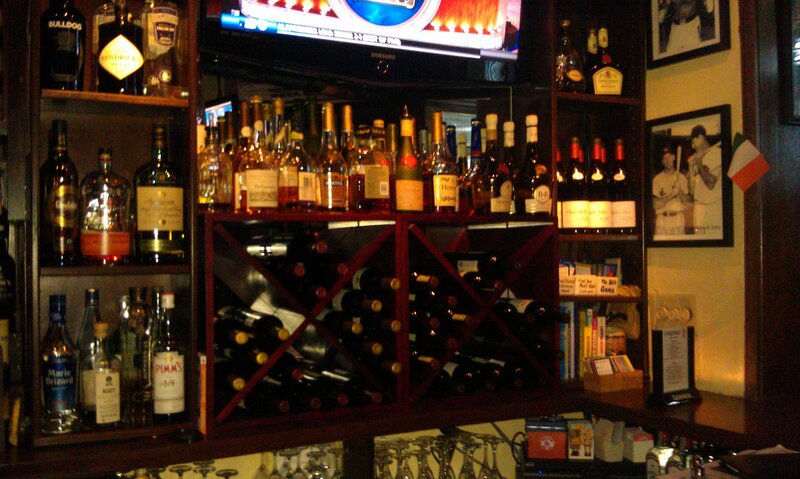 Also behind the bar I observed one of the largest assortment of liquors that I have seen in this city. They had tons of different scotches (wow that word looks funny typed out) and ryes. They had liquors I didn’t even know existed such as Pimms and Marie Brizard. They had whiskeys that will make spell-check go crazy like Aphoaig and Caol Ila (those words look like I just banged my hand against the keyboard). 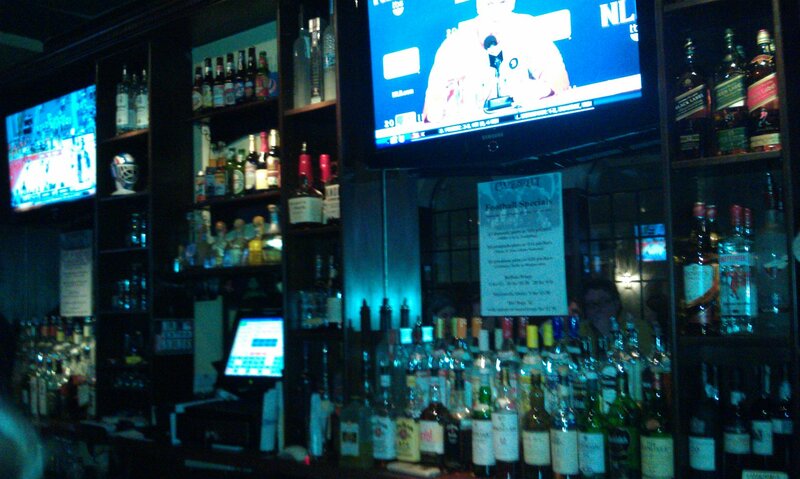 Honestly you can tell it’s a respectable bar just by looking at what is behind the actual bar. Inside the place, besides the plenty of colorful TVs, were black and white pictures along the walls. They seemed to be divided into categories such as athletes, movie stars, etc…but all iconic pictures and classy. I was sitting near the ones of Mark Messier holding the Stanley Cup, Bobby Orr flying through the air after his goal in the Stanley Cup, and the Four Horsemen. Just a very nice touch. Preconceived notion – I went here a couple of times primarily for dinner or brunch when I first moved to Hoboken and I was taking classes at Stevens. I really didn’t really remember much of a scene and kind of thought that this place would be dead, being forgotten about tucked away off of Washington. Crowd stereotype – Primarily around 30 (except the kid that was there) Some couples, some friends. Music – Seemed very 90′s/alternative rock. Value – It was pretty expensive. A pint of the Ayinger was $8 and the wine was $7ish. On football Sundays they have a $3-$4-$5 special with the cheap domestics on the lower end of the scale and working your way to the moderate domestics and then the classy imports on the higher end of the scale. Date – Was a very comfortable place for a date. Plenty of people, not too loud that you have to scream and not too quiet that everyone can hear what you are talking about. Classy enough to give the right impression. Hookup – Probably not on the night we were there. First or last drink of the night – This is great for that. Overall - I hadn’t been to Court Street for a while, because it never really left any impression on me the few times that I went there. However, after just stepping in the bar I knew that I had made a big mistake not coming back sooner. 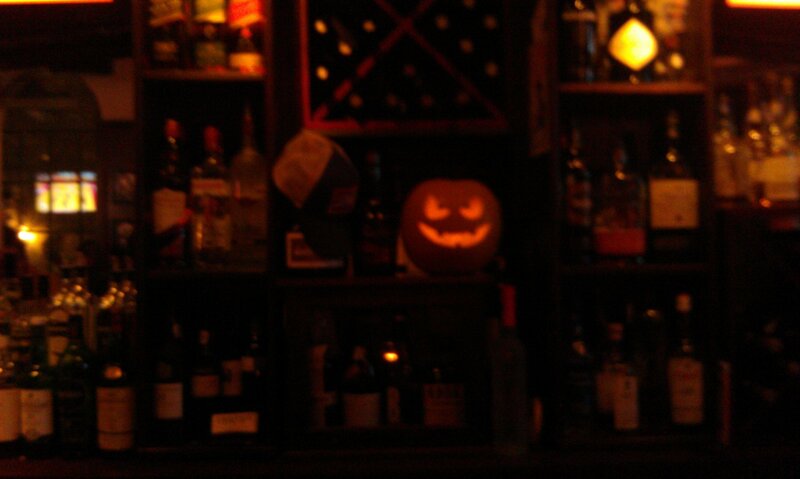 It is a perfect neighborhood bar. Despite its proximity to Stevens it didn’t have a young/dive feel. Instead it was very professional without being pretentious. Good for watching sports or just catching up. A little pricey but they have made it work for the past 30 years. Being able to rediscover places that I have forgotten/ignored is one of the main reasons I undertook this in the first place. I’ll give it an 8.9.